Heroes Inc Extravaganza - a 3-day auction with BINs! Help us clear some storage space and share gaming goodness with your family and friends! 1. Shipping to USA only. 2. Shipping is FREE for all buyers. 3. All sales will be processed as a batch through the BGG Marketplace so they get their 3%. 4. Payment through PayPal only. 5. Auction ends Sunday, Sep 22, sometime in the evening Central time. 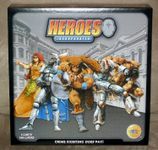 As a bonus, for every pre-packed case (6 units) of Heroes Inc sold, Quest Machine will donate one copy of Heroes Inc to the local Salvation Army as part of their annual Christmas gift drive for families. BIN: $25 with FREE USA shipping! Note: I will include the glossy Heroes Incorporated #0 comic with each purchase. BIN: $100 with FREE USA shipping! 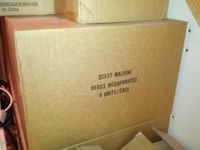 Note: this is for a case (6 units) of Heroes Incorporated. 6 cases available. BIN: $40 with FREE USA shipping! 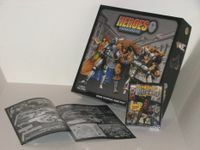 Note: includes Heroes Inc game, SUPER expansion, and promotional glossy Heroes Inc #0 comic book. These are the final copies of SUPER left in stock, and we have no plans to reprint, so grab a copy while you can!